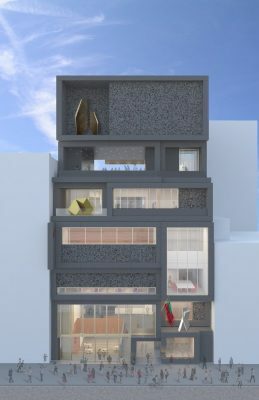 Undertaken as a public-private initiative in partnership with the City of New York, the entirely new 82,000-square-foot building will rise on West 125th Street on the site of the current facility, a centuryold commercial building that was adapted for the Studio Museum in the early 1980s by late AfricanAmerican architect J. Max Bond Jr. 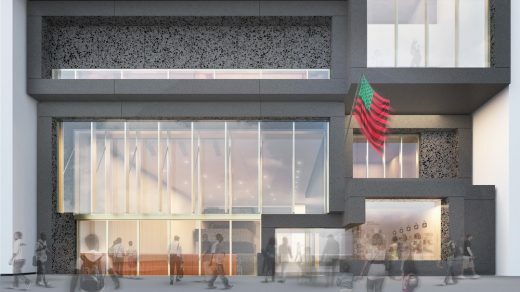 The new building is designed to express the Museum’s core values of openness and engagement as they have been lived throughout a five-decade history of innovative and impactful exhibitions and programs, while also providing exceptional new spaces to elevate the Museum’s service to artists, audiences, the uniquely vibrant Harlem community, and the world of art. • and an increase in outdoor space of 105 percent, from 3,900 square feet to almost 8,000 square feet. Galleries for temporary exhibitions and the Studio Museum’s unparalleled permanent collection are provided on the second, third, and fourth floors. An education center occupies part of the third floor, adjacent to a double-height gallery with a barrel-vaulted ceiling. 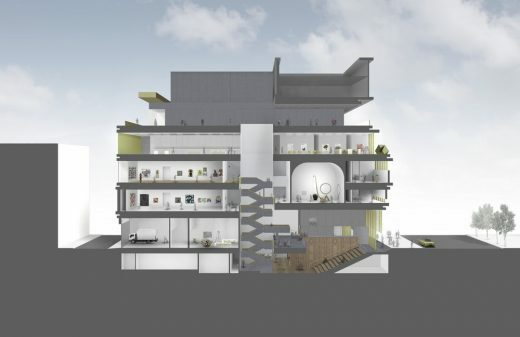 The fourth floor accommodates both an exhibition gallery and dedicated spaces for the signature Artist-inResidence program, which puts the “Studio” in the Museum’s name. Staff offices are located on the fifth floor, and the roof is designed for use as a terrace and event space. 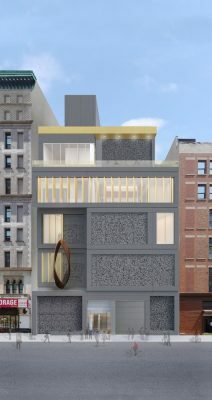 Niches on the facade on both the 125th and 124th Street sides of the building will display outdoor sculpture. 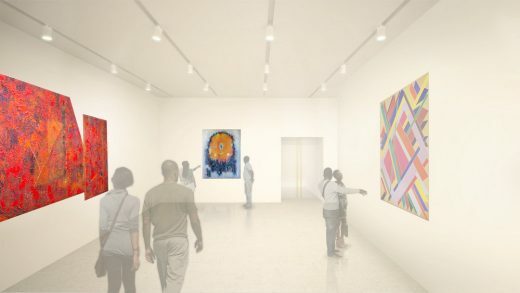 Artworks will permeate the entire interior of the building as well—in the graciously proportioned formal galleries provided with fine-art temperature and humidity controls, and (for less sensitive objects) in the public corridors and common areas. • and Their Own Harlems, organized in honor of the centennial of the birth of Jacob Lawrence (1917–2000), with works by some twenty artists of different generations reflecting on Harlem as both an actual neighborhood and a symbolic place. 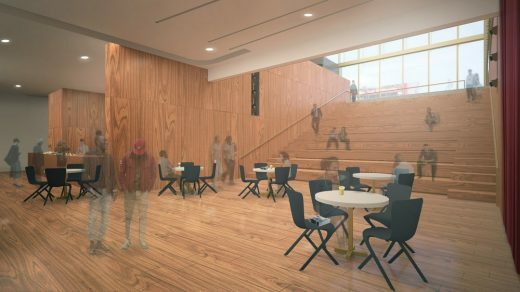 • The New York Public Library’s George Bruce Library at 518 West 125th Street is the new home for Books, Authors & Kids! and Studio Salon, the Museum’s literary series for children and adults, respectively. • A unique academic program organized by the Barnard Center for Research on Women and the Department of Africana Studies at Barnard College, The Harlem Semester encourages students to learn about Harlem’s history through immersion in the neighborhood under the mentorship of key cultural organizations, including the National Black Theatre, Apollo Theater, Harlem Stage Gatehouse, Schomburg Center for Research in Black Culture, National Jazz Museum in Harlem, and Romare Bearden Foundation. The third Harlem Semester will begin in spring 2018. 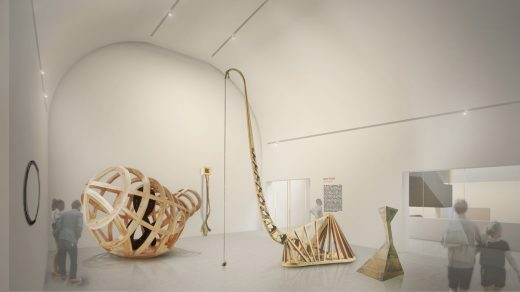 • The Studio Museum’s eponymous Artist-in-Residence program will continue during the inHarlem period. The 2018 residents and their studio location will be announced later in 2017. • Expanding the Walls, the Museum’s rigorous, eight-month teen photography program, will also continue during inHarlem. • Artist talks, panels, screenings and hands-on workshops for adults will continue to take place throughout the neighborhood in new venues. • Family programs, including the Museum’s beloved Lil’ Studio program, will also move to library and community locations. The collection will also find a significant place in local schools through new resources for teachers and students. Downloadable lesson plans featuring works from the collection will be made available on studiomuseum.org for use in classrooms locally, nationally, and internationally. The Museum’s educators and teaching artists will also bring innovative lesson plans and hands-on activities, based on investigations of the permanent collection, to students at the Museum’s partner schools in Harlem. And in fall 2018, the Museum will launch a program to place reproductions of iconic collection works at public sites throughout Harlem, including in schools. Founded in 1968 by a diverse group of artists, community activists, and philanthropists, The Studio Museum in Harlem is internationally known for its catalytic role in promoting the work of outstanding artists of African descent. 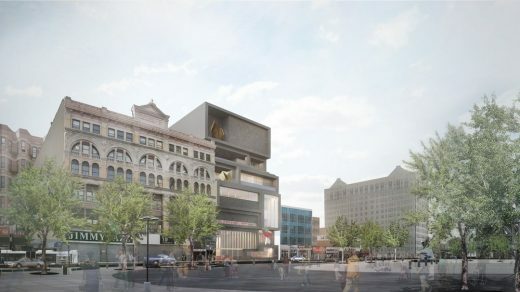 Now approaching its 50th anniversary, the Studio Museum is preparing to construct a new home at its current location on Manhattan’s West 125th Street, designed by internationally renowned architect David Adjaye with Cooper Robertson as the first building created expressly for the institution’s program. 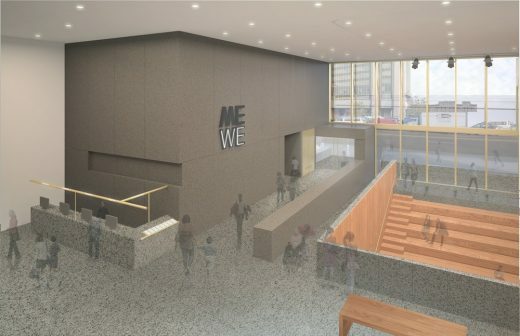 The new building will enable the Studio Museum to better serve a growing and diverse audience, provide additional educational opportunities for people of all ages, expand its program of world-renowned exhibitions, effectively display its singular collection, and strengthen its trailblazing Artist-in-Residence program. The Artist-in-Residence program was one of the institution’s founding initiatives and is the reason why “Studio” is in the name. The program has supported more than one hundred emerging artists of African or Latino descent, many of whom who have gone on to highly regarded careers. Alumni include Chakaia Booker, David Hammons, Kerry James Marshall, Julie Mehretu, Wangechi Mutu, Mickalene Thomas, and Kehinde Wiley. The collection includes nearly two thousand paintings, sculptures, works on paper, prints, photographs, mixed-media works, and installations dating from the nineteenth century to the present. Artists represented include Romare Bearden, Robert Colescott, Jacob Lawrence, Norman Lewis, Chris Ofili, Betye Saar, Lorna Simpson, Kara Walker, and Hale Woodruff, as well as many former artists in residence. The Studio Museum is the custodian of an extensive archive of the work of photographer James VanDerZee, the renowned chronicler of the Harlem community from 1906 to 1983. The Studio Museum’s exhibitions expand the personal, public, and academic understanding of modern and contemporary work by artists of African descent. A wide variety of on- and off-site programs brings art alive for audiences of all ages—from toddlers to seniors—while serving as a bridge between artists of African descent and a broad and diverse public. A leader in scholarship about artists of African descent, the Studio Museum publishes Studio magazine twice a year and creates award-winning books, exhibition catalogues, and brochures.